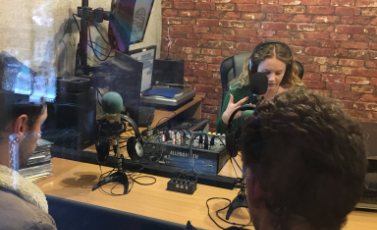 This week, I welcomed not one, not two, not three, but FOUR guests into the studio this week to discuss the barriers facing young people entering into the journalism industry and the need to diversify the newsroom. I spoke with two local Journalism students, Dylan Donnelly and Frazer Norwell, who have first-hand experience of having to overcome formidable obstacles when trying to break into such a seemingly impenetrable industry. Their trials and tribulations were tempered by the fabulous Olivia Crellin, who spoke about her pilot scheme, PressPad, which offers free accommodation, mentoring, networking, and other fantastic perks for anyone with an unpaid internship in London related to journalism. Laura García is a lecturer at the University of Kent, a freelance journalist and producer, and part of the PressPad team, who offered both an academic perspective and a practical perspective for any budding journalists looking for a little guidance. We discussed the pros and cons of studying Journalism and gaining experience through internships since it’s never too late to side-step into journalism. What a fantastic group of guests and what a diverse insight they gave about the industry.